Now in new format: Tough. Light. Waterproof. Printed on polyethylene. Supplied folded in a plastic pocketThis map for hillwalkers provides an enlargement of the summit of Ben Nevis at 1:12,500 scale. 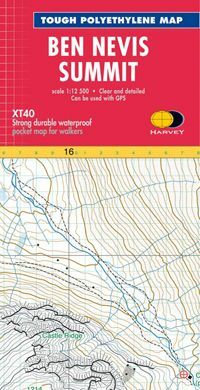 Size A3 (297x420mm).Useful for detailed navigation in this complex area, particularly in poor conditions. Has a 100m grid for use with GPS or a romer. Includes the bearings for the escape route recommended by the Mountain Rescue.